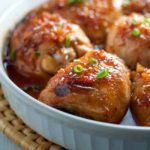 This Asian Glazed Garlic Chicken features tender, juicy chicken thighs glazed with an Asian-inspired sauce. It has a little heat and hints of garlic, sesame and ginger. instead of soy sauce to keep this dish Paleo. This chicken dish makes an easy weeknight meal. Just whisk the marinade, add it to the chicken in a resealable bag and let it sit in the refrigerator until you’re ready to pop it in the oven. No searing in a skillet first! Whisk: Whisk together the marinade ingredients. Marinate: Put the chicken and half the marinade in a resealable bag. 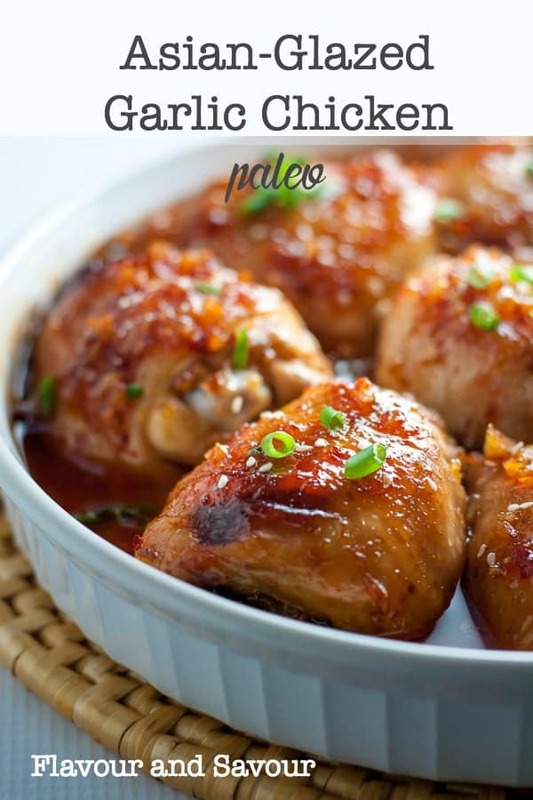 Glaze: Heat the remaining marinade in a pot until it is reduced by half. Bake: Drain chicken, brush with the reduced glaze and bake in the oven. 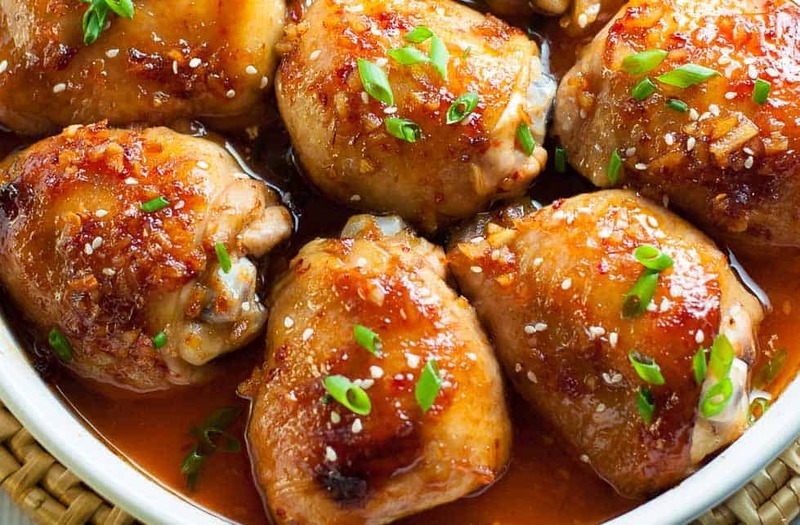 This Asian Glazed Garlic Chicken pairs perfectly with Thai Coconut Rice. 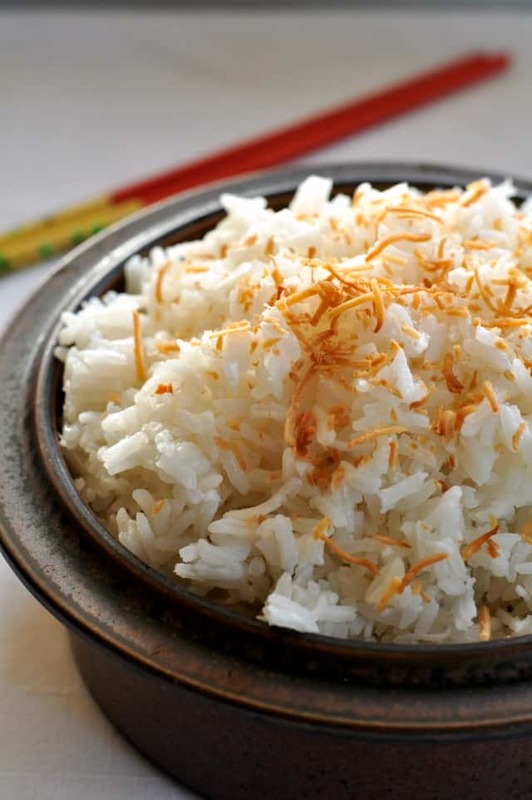 Serve with rice and a salad for a quick weeknight meal. Did you hear your yum alert go off? Time to make this chicken dish! You can, of course, use chicken breasts instead of thighs or boneless chicken parts instead of bone-in. Just reduce the cooking time accordingly. 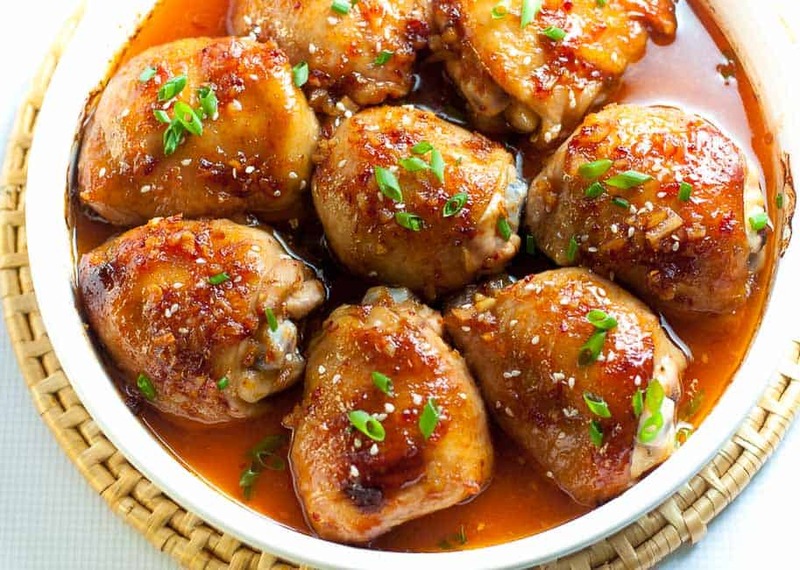 This Asian Glazed Garlic Chicken recipe features tender, juicy chicken thighs. It has a little heat and hints of garlic, sesame and ginger. Whisk together the vinegar honey, coconut aminos, sesame oil, Sambal Oolek, garlic, ginger and salt. Put the chicken in a zipper-closure plastic bag (or a marinating container) and pour half of the marinade on top. Seal the bag carefully and massage the marinade into the chicken pieces. Lay flat and refrigerate for at least an hour. Pour the remaining marinade into a saucepan. Bring to a boil over medium heat and cook for 5 to 6 minutes, stirring often until reduced and slightly thickened. Preheat oven to 350F. Remove the chicken from the bag and discard the used marinade. 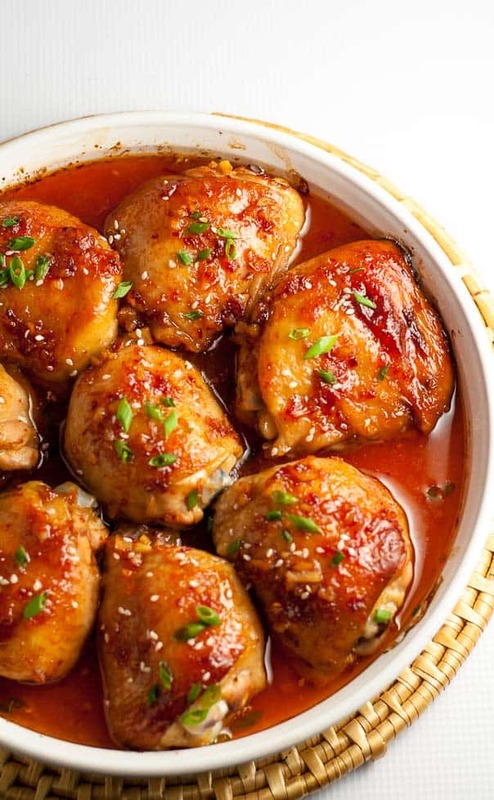 Place chicken thighs into a baking dish, and brush with 1/3 of the thickened marinade from the saucepan. Bake for 45-50 minutes, basting again after 10 - 15 minutes. Chicken will be done when a meat thermometer indicates it has reached at least 165F. Remove from oven, cover with foil and let stand for 5 - 10 minutes. Meanwhile, boil remaining marinade for 1 to 2 minutes and serve alongside the chicken. Garnish with chives or green onions. 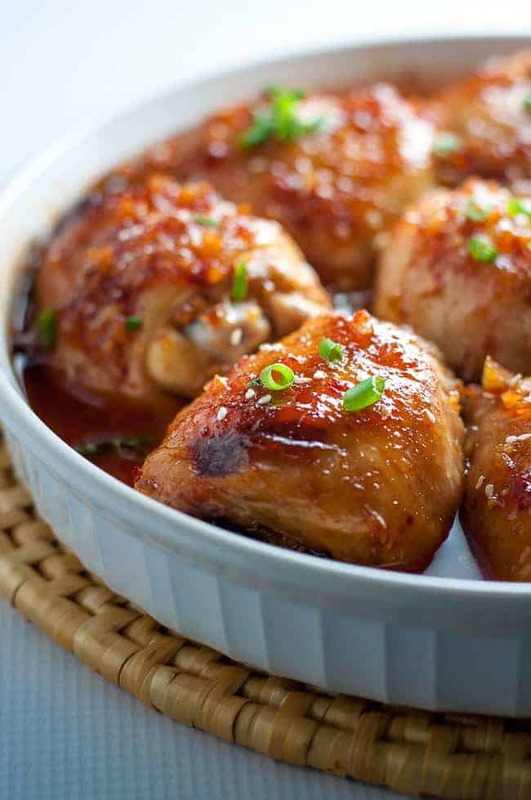 Like this recipe for Asian Glazed Garlic Chicken? Pin it or share it! Subscribe to my weekly newsletter and never miss a recipe.